FULL TIMEThe final siren sounds and the Crows have run out easy 60 point winners over the Power. Shaw takes a set shot on goal 45m from goal on a 45 degree angle. He sprays the shot on goal as it goes out on the full. 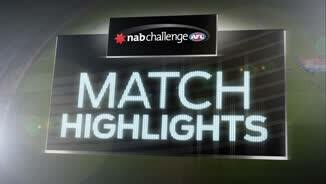 The Power and the Crows both face trips on the road for their next NAB challenge game. Both playing at Etihad Stadium. 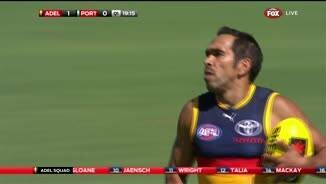 BEHIND CROWSJohnston has a quick shot on goal and he misses, as the Crows look to run out the game. 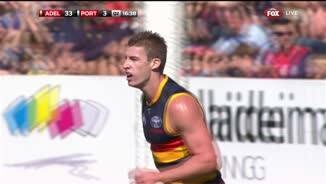 Adelaide are doubling the score of the Power at the moment, kicking double the amount of goals and behinds, to lead by 59 points. BEHIND CROWSThe Crows go from coast to coast, as Ellis-Yolmen runs onto the ball, casually has a shot on goal and pushes it away to the right. BEHIND POWERO'Shea has a long range shot on goal and it bounces away to the right for a point. GOAL CROWSJaensch kicks it to an open 50, as Cameron runs onto it, has a shot at goal and kicks it straight through the middle. BEHIND CROWSBetts snaps from 45m, but it bounces to the left and through for a point. GOAL POWERNewton gathers it from the pack, snaps at goal and drills it. The Power have brought it back to a 52 point margin. GOAL POWERWhite runs it inside 50, he looks up at goal and deposits the ball in between the big sticks. The Power are giving their fans reason to cheer in this final term. Interestingly, Betts has faded out of the game, since about the mid way of the third term. GOAL POWERPaul Stewart comes out and takes a strong mark 45m from goal on a slight angle. He kicks truly as the Power cut the lead by to 64 points. GOAL CROWSJohnston takes a powerful mark 40m from goal. He comes in and threads the eye of the needle. GOAL POWERByrne-Jones gathers the ball 25m from goal, he kicks around the corner and scores his first goal of the day. It appears that the tempo of the game has dropped off a little, as skill errors start to creep into general play. The Crows are away through the middle, as they look to set up another attacking play. GOAL POWERNeade pushes the ball forward, into the advantage of White, who swoops, kicks around his body and goals. We are under way for the final term of the game. THREE QUARTER TIMEThe Crows go into the final break holding a 76 point advantage over the Power. With a bit more exposure in the seniors, ByrneJones certainly looks like a gem for the Power. GOAL POWERLogan marks 30m from goal, directly in front. He kicks it straight through the middle and kicks the goal. The Power are missing that many players, that not even their regular coach has turned up today, with Peter Rhode taking the reigns. GOAL CROWSSloane with a big kick from 45m out and it sails through for a goal. The Crows now lead by 82 points. We are heading for a three figure margin. Dangerfield and Neade have an altercation in the middle of the ground. Dangerfield is given the free kick, but as he pushes Neade back, he puts on an Academy Awards performance. 50m penalty. GOAL CROWSLyons finds some space and marks 40m from goal on a slight angle. He kicks truly and the margin is back out to 76 points. 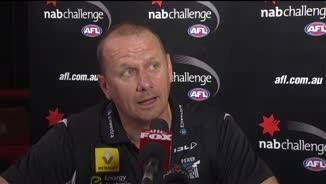 The Power will be wanting an improved performance in the final term, just to give them the confidence, going into their next game. SUBSTITUTION POWERByrne-Jones has been activated into the game, as Renouf has come off the ground and taken the red vest. GOAL POWERYoung snaps at goal 35m from goal as it goes through the big sticks for a major. There is a score review, to see if the ball was touched, but the decision is that the goal stands. Neade has a sweeping shot at goal, but it is to no avail as it goes out on the full. 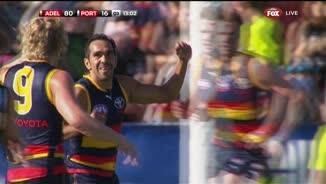 GOAL CROWSFrom the middle, the ball goes back into the Crows forward line, as Douglas takes the spill from the pack and kicks his second goal of the afternoon. GOAL CROWSBetts roves it from the pack, he kicks around the corner for his fifth goal of the day. 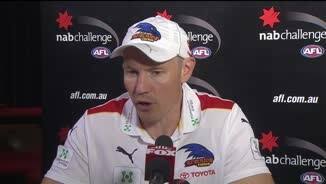 The Crows lead by 70 points. GOAL CROWSJenkins hands it off to Kerridge, who runs around his opponent, bombs it long for goal from 45m and just clears the goal line. BEHIND CROWSTalia marks the ball 45m from goal, he goes for home and he shanks it, kicking it across the face of goal and sneaking it through for a point. Renouf cops a corky in the ruck contest and will have to wait for the pain to subside before he can become mobile once again. Betts goes for the screamer and it looked good too, however the only problem was that he went up a few seconds early, giving away the free kick in the end. GOAL CROWSBetts is taken high by Broadbent as he went down to pick up the ball. He is given a free kick, 30m from goal directly in front. He kicks his fourth goal of the day. We are back for the second half of the game, as the Crows once again get first use of the ball from the middle. HALF TIMEThe Crows go into the main break extending their lead to 51 points over the Power at the main break. GOAL CROWSDouglas marks it 45m out on a 45 degree angle. He kicks it well and gives the Crows a 51 point lead. BEHIND CROWSEllis-Yolmen gathers it inside the 50, he kicks around his body and he pulls it away for a minor score. GOAL CROWSWright marks 45m from goal, directly in front. He comes in and splits the middle. The Crows are on fire at the moment. BEHIND CROWSJohnston marks 35m from goal directly in front. He gives it a bit of a roost and just sneaks it through for a point. GOAL POWERStewart marks the ball 40m from goal directly in front. He kicks it straight through the middle. SUBSTITUTION POWERByrne-Jones has been activated in place of Clurey. Both names not common as yet in the AFL world. GOAL CROWSIt is Eddie everywhere at the moment, as Betts marks 15m from goal directly in front. He kicks his third goal of the day. BEHIND CROWSCameron marks the ball 40m from goal on a slight angle, he comes in with his kick and he misses away to the left. BEHIND POWERRenouf kicks it through the hands of a Crows defender, as the ball goes over the goal line for a point. The Power would be wanting an improved performance as a lot of young players are under the microscope today. SUBSTITUTION POWEROllie Wines has been activated in favour of Young, however the subs reset after half time, so Young's day may not be over as yet. GOAL POWERYoung gathers it inside the 50, he takes a shot on goal and kicks Port Adelaide's first goal for the game. GOAL CROWSWright takes the handball from Grigg, sizes up the sticks and splits the middle. The Crows are up by 43 points. BEHIND CROWSBetts leads out from the goal square and marks 15m from goal. He kicks from an acute angle and just couldn't get it to come around enough. GOAL CROWSBetts gathers it on the 50, he kicks it over to a leading Jenkins, who plays on and slots it through for a goal. BEHIND POWERNeade marks 65m from goal, he hands it off to Broadbent who loads up for a super goal, but it is away to the right. BEHIND CROWSDouglas swoops onto the ball inside 50, has a shot on goal and he is off target and through for a point it goes. We are back for the second term as the umpire thumps the ball into the middle of the ground. QUARTER TIMEThe Crows go into the first break holding a handy 30 point lead over their arch rival, the Port Adelaide Power. GOAL CROWSSmith marks 50m from goal directly in front. 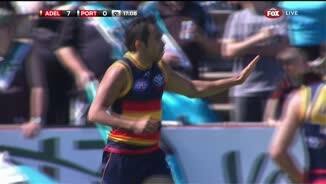 He kicks truly as the Crows lead by 30 points. The Crows are all over the Power, with neither team wanting to show their cards, ahead of a Round 2 showdown at Adelaide Oval. BEHIND POWERStewart is infringed and is awarded the free kick, advantage is paid as he plays on but he kicks a point. It is interesting to see if the Power can get back into the contest, considering the personnel that they are missing for the game. GOAL CROWSPodsiadly hands it off to Porplyzia who drills it for goal. The Crows lead by 25 points. The Power are without a bunch of their regular team, virtually playing their seconds lineup. GOAL CROWSPodsiadly marks 10m from goal directly in front. He slots it through for his first goal in Adelaide colours. BEHIND POWERNewton marks 40m from goal on a 45 degree angle. He comes in and hits the post. The Crows continue to streak down the midfield but the Power are giving as good as they get at the moment. The Power have settled after a nervous start. Renouf marks 45m from goal on a slight angle, he has a shot on goal and puts it out on the full. BEHIND CROWSThe ball goes through the hands of Porplyzia, as he attempts to kick it for goal, but he can only manage a behind. GOAL CROWSBetts comes out and takes another mark as he kicks from 40m out. He kicks his second as he celebrates with his new team mates. GOAL CROWSBetts comes out and takes the mark 35m from goal. He comes in and slots through his first goal in Adelaide colours. BEHIND CROWSMartin swoops on the ball around 50, he has a shot on goal and it is offline. The siren sounds to start the game as the Crows get first use of the ball. Welcome to Richmond Oval, a rare location for an unofficial Showdown match between Adelaide and Port Adelaide.